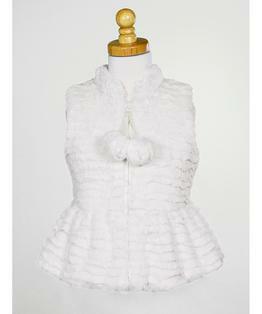 This little faux fur vest by Widgeon has all kinds of style and just enough warmth! Pom-poms hang playfully from the zip front and pull together the mandarin collar. The peplum adds extra flounce that every girl loves. This super-soft faux fur with subtle textured pattern outer layer has a comfy plush micro fur lining. Pom-Pom Zipper Pull. 100% Polyester. Machine Washable.